1(a) Explain briefly the boundary layer formation and define boundey layer thickness. (5 marks) 1(b) With neat sketch explain working and construction of a Venturimeter. (5 marks) 1(c) A two dimensional flow field is given by u=2y2,3x. Find the acceleration at point (-2,4)(5 marks) 1(d) A metallic body floats at the interface of mercury. (SP.gravity 13.6) and water in such a way that 30% of its volume is submerged in mercury and 70% in water. Find the density of the metalic body. (5 marks) 1(e) Define Fluid and explain types of fluid in detail. (5 marks) 2(a) Derive the differential fromof the general mass conservation equation for a fluid in Cartesian coordinate system. 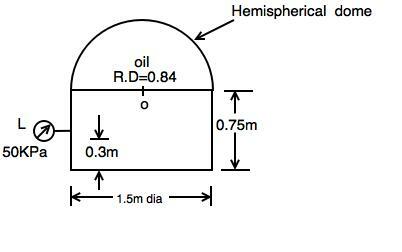 (10 marks) 2(b) A cylindrical tank 1.5 m diameter and height 0.75 m has a hemispherical dome. The tank contains oil of relative density 0.84 as shown in fig. The dome is joined to the cyclinder portion by four equally spaced bolts. Determine the force on each bolt. i) Check if boundary layer separation occurs. ii) Determine Boundary layer thickness (In terms of Re)(10 marks) 4(b) Derive Euler's equation of motion in Cartesian co-ordinate system and from this derive Bernoulli's Equation for liquid. State assumptions made in the derivation of Bernoulli's Equation. (10 marks) 5(a) Air has a velocity of 1000 km/hr at a pressure of 9.81 KN/m2 vacuum and a temperature of 47°C. Compute its stagnationa properties (Pressure, Temperature and Density). Take atm. Pressure 98.1 KN/m2, R=287J/Kg°K and γ=1.4(10 marks) 5(b) A flow has a velocity potential function is given by θ=x3-3xy2. Verify whether it represents a valid flow field. If it does then determine the stream function and calculate the velocity and pressureat (1, -3) given that pressure that the pressure at(4, 1) is 14 Kpa and the fluid is water. (10 marks) 6(a) Two reservoirs are connected by three pipes in series.